Partnership between data providers likely to improve consistency of neighborhood boundaries and listing search results across real estate websites. Onboard Informatics is gearing up to release an API (application programming interface) that will make it easier for property search tools to update and and display local data. In replacing its geographic boundary data with Maponics’ boundary data, Onboard Informatics can focus more energy on perfecting its listing, market and neighborhood data products. A San Francisco homebuyer may want to see all homes in the hilly Nob Hill neighborhood of the city. But online real estate sites render homes in the flats of the Tenderloin. Two completely different neighborhoods. Buyers online typically filter listings based on geographic areas, such as neighborhoods, ZIP codes or cities. But different real estate sites can use different sets of geographic boundaries, generating different listing results for searches of the same areas and creating confusion around where communities begin and end. A new partnership between two of the most popular providers of neighborhood information and geographic boundaries is likely to significantly reduce these inconsistencies. Onboard Informatics is retiring the geographic boundary sets baked into the neighborhood, listing and market data that it feeds to real estate search tools, and replacing them with boundary sets offered by Maponics. 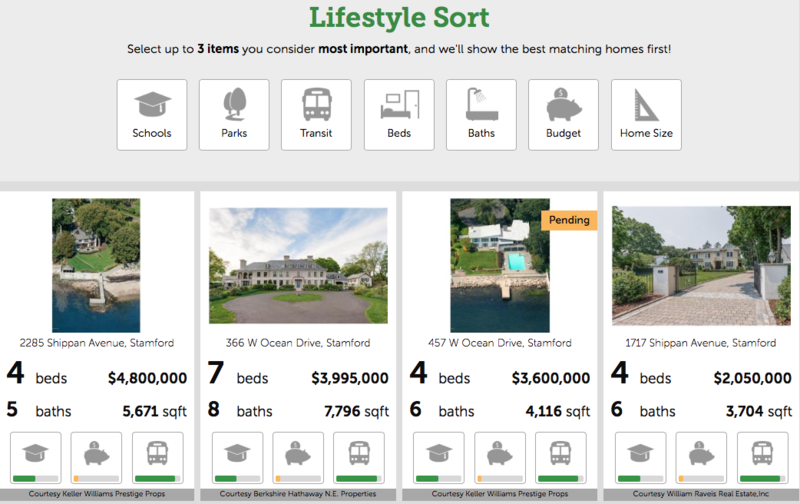 Screenshot showing Better Homes and Gardens Onboard Informatics-powered property search tool. The tool lets buyers filter listings based on an array of lifestyle factors, including school and transit quality. Maponics’ boundary sets delineate areas including neighborhoods, residential subdivisions and school attendance zones. The partnership will also inject Maponics’ boundaries into data products sold to real estate firms by other data providers. That’s because other data providers, including CoreLogic, incorporate local data from Onboard Informatics into their own offerings. In the not-too-distant future, buyers who filter listings based on geographic regions like neighborhoods, school zones or subdivisions, or who pull up profiles of neighborhoods, will be much more likely to see the same listings and the same neighborhood data across a wide range of real estate websites. “Because we [Onboard Informatics and Maponics] have such a large market share in terms of the MLSs, websites [and] broker applications that we power, it means that consumers and real estate professionals are going to be able to have one clear standard definition of a neighborhood, of a school zone, of a community, across the entire industry no matter what site they’re on,” said Jonathan Bednarsh, CEO of Onboard Informatics. Maponics says it feeds geographic boundaries to companies including Zillow, Trulia, Century 21, Redfin, ApartmentList.com, FindTheBest (operator of FindTheHome) and Rent.com. Onboard says it provides data — which can include IDX (Internet data exchange) listing feeds from more than 100 multiple listing services — to Redfin, Coldwell Banker, Century 21, ForSalebyOwner.com, Better Homes and Gardens Real Estate, The Corcoran Group and Douglas Elliman. The partnership reduces competition between the two firms, allowing them to focus more energy on their core competencies. For Onboard Informatics, that means devoting more resources to building out what it says is the “best-in-class” local data offering, which spans everything from MLS listings, home valuations, “points of interest,” and property, demographic, lifestyle and school data. The firm will soon release a new API (application programming interface) that will make it much easier for real estate search tools to deploy and update that local data, Bednarsh said. Onboard already offers an API that can equip property search tools with IDX feeds from more than 100 MLSs. Maponics offers some of the same local data as Onboard Informatics, so the two firms will remain competitors to some degree. But Maponics is focused primarily on entrenching its position as the dominant provider of geographic boundaries. The partnership paves the way for further collaboration. Maponics will continue to build out neighborhood data products that overlap with Onboard’s, but will work with Onboard and other partners to determine the best way to provide local data to clients, she said. Sometimes that might mean providing its own neighborhood data to clients. Other times, it would mean feeding them another company’s data, like Onboard’s data, mixed with Maponics’ boundaries. Bednarsh said that Maponics may even leverage Onboard Informatics’ “delivery systems” — a reference to Onboard Informatics’ data APIs. Editor’s note: This story has been updated to correct that Bednarsh was referring only to Onboard Informatics and Maponics when he stated that “we have such a large market share.” A previous version of this story incorrectly indicated that “we” also referred to CoreLogic.